The toll in the Caribbean from Tropical Storm Olga, a rare December cyclone, has risen to at least 38 confirmed deaths, officials say. Hardest hit was the Dominican Republic, where at least 35 people have been killed by floods and landslides. The death toll rose again on Friday after the bodies of 12 immigrants from neighbouring Haiti were discovered in Castanuelas, a town near the border. The UN has urgently appealed for $4m (£2m) to help the many left homeless. The storm slammed into the region on Tuesday - 10 days after the official end of the Atlantic hurricane season. The flood waters are now subsiding, only to reveal the extent of casualties from the storm. The 12 Haitians whose bodies were found on Friday probably "had no documents and hid themselves when we ordered the evacuation of the flooded areas", civil defence officer Juan Nunez said, according to Reuters news agency. Added to at least 23 other deaths in the Dominican Republic, and a further three in Haiti and Puerto Rico, at least 38 people are now known to have died. Tens of thousands have been left homeless, and the UN's World Food Programme has made an urgent appeal for funds to help them. The majority of other casualties in the Dominican Republic happened in the northern city of Santiago, after officials, fearing a collapse of a dam, released billions of gallons of water into the already swollen Yaque River. Furious residents later said officials had warned them just minutes before the water was released. "They warned us but there was no time... everybody was sleeping," Sonia Duran Maldonado told the Associated Press news agency. "They must beg our forgiveness for what has happened," she added. Reports say some 10,000 homes have been damaged by the storm, along with thousands of hectares of banana and plantain crops, hitting export revenues, say authorities. 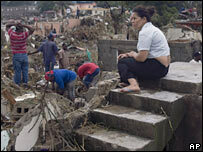 Olga spared south-western areas of the Dominican Republic hit by Tropical Storm Noel six weeks ago, where dozens of people were killed.